For 15 years, the Blue Springs Public Art Commission has worked diligently with the community to infuse its city with art. This year’s public art theme is ‘Firefighter Spirit’ and four artists were selected to display artwork at Central Jackson County Fire Protection District (CJCFPD) stations. These temporary pieces will be on display until fall 2016. 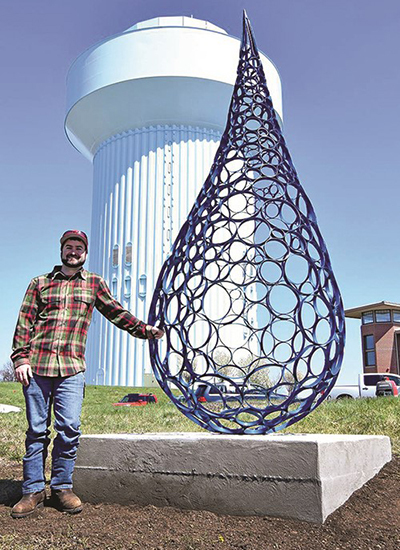 Artwork from this temporary program may be selected for permanent display in Blue Springs and would be purchased with private money raised as the result of fundraising efforts headed by the Commission and friends of public art. Click http://www.bluespringsgov.com/1842/2016-Temporary-Art-Exhibit—Firefighter to view the full article and to select Noah’s sculpture in the People’s Choice Survey.